Understanding how the media works depends on your world view and your world view depends on your history…..
Before we can examine the relationship between the media and its audiences we need to understand that arguments and evidence about this relationship arise from three ways of thinking of about the role of media and society. These 3 models seem to be the overarching approach to Media and its Influence over audiences. •	The Political Economy Model: holds that the media is simply part of an economic system where power and control reside in political and economical institutions. Under this model, the media transmits the messages these institutions determine. •	The Effects Model: holds that media forms and content have strong effects on individuals and society. 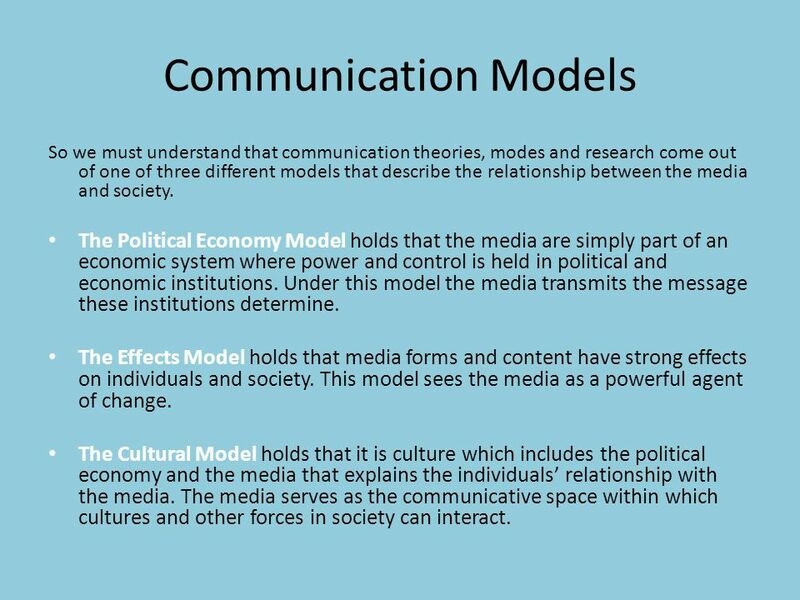 This model sees media forms and texts as powerful agents of change and not always for the better. •	The Cultural Model: holds that it is culture – which includes the political economy and the media – that explains the individual’s relationship with the media. The media serves as the communication space within which cultures and other forces in society can interact.